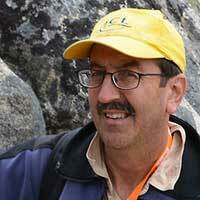 Brad Singer, Professor of Geoscience, is director of the WiscAr laboratory. Brad drives the development of new analytical techniques and geological applications of 40Ar/39Ar dating, and oversees WiscAr staff and students. He creates web-based training materials, and delivers short courses on geochronology. Brad also engages with researchers, students, and lab staff to design and implement projects, and help them understand and report data in peer-reviewed papers. Brad completed his B.A. in Geological Sciences at the University of California-Santa Barbara, M.S. in Geology at the University of New Mexico, and PhD in Geology at the University of Wyoming. He was a visiting Assistant Professor at the University of Michigan, and an Assistant Professor at the University of Geneva, Switzerland, before joining the faculty at the University of Wisconsin-Madison in 1999. His research uses high-precision geochronology to resolve fundamental problems, mainly in three areas: (1) linking the long-term evolution of volcanoes to current states of activity and unrest, (2) the history of the earth’s magnetic field and geodynamo, and (3) chronostratigraphy and evolution of sedimentary basins. The WiscAr laboratory is sought out by researchers and students outside of the University of Wisconsin-Madison to address volcanic, igneous, tectonic, and sedimentary processes.